Note: You can enter this giveaway two (2) times per e-mail address per day. Deadline is 11:59PM ET 1.2.19. Be prepared! Those scouts were onto something, and when you have the Wusthof Gourmet Traveller Set in tow, you’re sure to be ready for whatever comes your culinary way. The set is compact enough to go along with your picnic basket, camping gear, or tailgating paraphernalia. 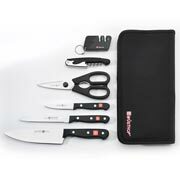 It includes a 3-inch paring knife, 5-inch serrated utility knife, and 6-inch cook’s knife, plus a waiter’s corkscrew, kitchen shears, and a mini sharpener – all in a zippered case. With this set, not only will you be able to amaze your friends with your cooking prowess when you prepare the recipes in our Tailgating Slideshow, but you can also show off your inner MacGyver. NO PURCHASE NECESSARY TO ENTER OR WIN. Void where prohibited by law. Open to legal residents of the 50 U.S., D.C. and Canada (excluding Quebec) who are at least eighteen years old at the time of entry and have internet access. Begins on 11.7.18 at 12:00:00 a.m. ET and ends on 1.2.19 at 11:59:59 p.m. ET. To enter the giveaway, submit your full name and email address on this form. Odds of winning this giveaway depend on the total number of eligible entries received. Only two (2) entries per email address per day. Sponsored by Leite’s Culinaria, Inc. For more information, visit our Official Rules. Be sure to add giveaways@leitesculinaria.com to ensure notification if you are the winner.